Roll out dough, add filling, and let rise again. Bake at 325 for 20-25 mins. Place on pan close together. Frost with icing made of icing sugar, margarine, a dash of salt, warm milk, and vanilla. Soften yeast in warm H2O and 2 tsp. sugar. Scald milk and pour over stiffly beaten egg whites. Add softened butter and egg yolks that have been beaten with the sugar until thick and lemon coloured. To this add the yeast mixture, and add enough flour to make a soft dough. Let rise till light. Pinch off little pieces, rolling them into strips, forming figure eight. Fill the holes with lemon filling. Let rise again and bake at 350 for 20 mins or until a golden brown. Cook filling as directed on package. Combine lukewarm milk, 2 tsp. sugar and yeast and stand until dissolved. Add eggs. Cut fat into dry ingredients. Stir in liquids. Knead until smooth. Let rise until double. Punch down and cut into 1” pieces. Roll into balls. Spread ¾ c. syrup and toasted coconut in bottom of greased, large angel cake pan. Dip balls in syrup, roll in coconut, and arrange in layers with a few raisins between. Let rise until double. Bake at 375 for 40 mins. Invert and brush with syrup. Orange syrup: Bring to boil 1 c. orange juice, 1 tsp. grated orange rind, ½ c. sugar, orange marmalade and 3 tbsp. butter. Cook spuds and drain. Mash potatoes. Dissolve sugar and yeast in water, let stand 10 mins. Scald milk and add shortening and flour. Mix with yeast and spuds and let sponge rise until double in bulk. Boil raisins and drain, add to sponge, then add flour and other ingredients. Knead out and let rise. Roll out dough and cut with cutter. Snip cross with scissors and bake 25 mins at 425 F.
Hilda Friesen [Omar’s wife], 1990? Dissolve sugar, water, and yeast together. Heat milk to boiling, then add butter, sugar, and salt. Stir and cool. Beat eggs, add to milk mix. 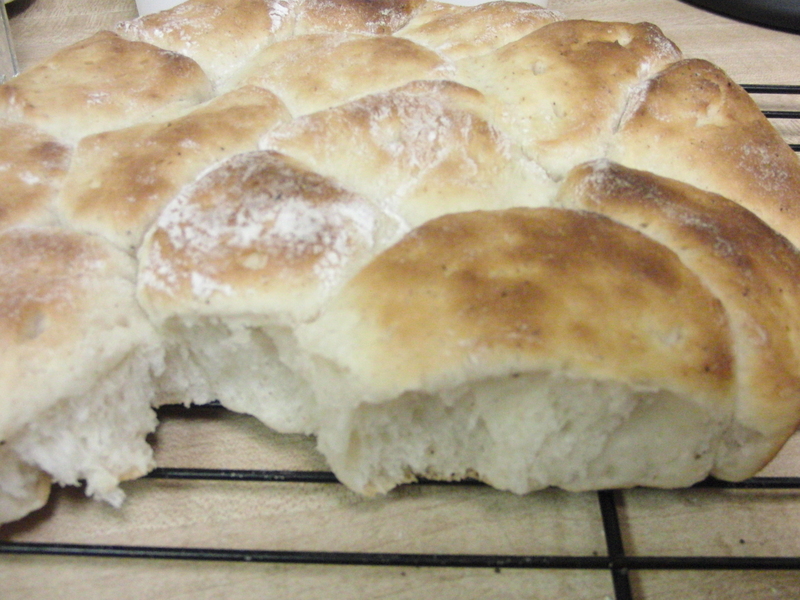 Stir in yeast mix and flour to make a soft dough. Rise on pans, then bake at 375 for 20 mins. 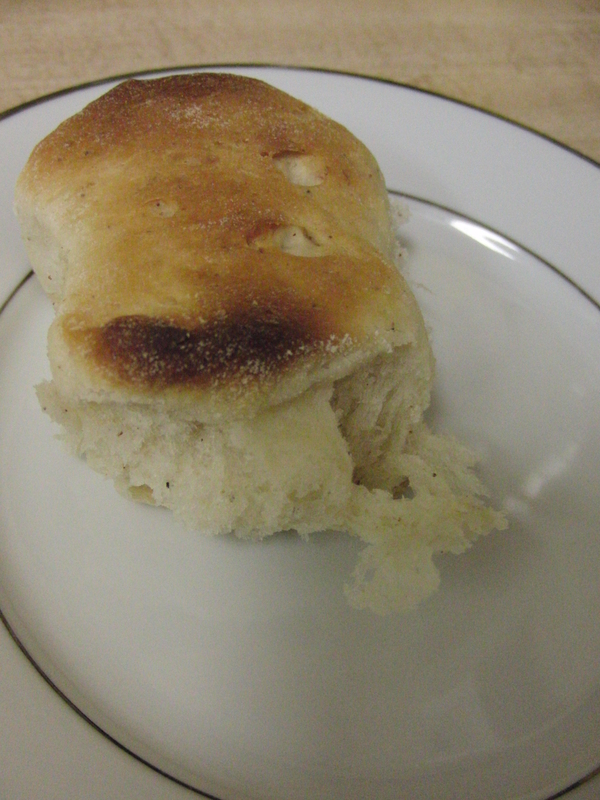 For smaller buns bake at 365 for 15 mins. (“Made 3 dozen on morning of Feb 2/ ’10”). Grandma says: When you make these, make a smaller bun and put it on top of the larger bun, then give it a firm press down with your thumb or else all the small buns will roll off the tops. Knead out, let rise and set on pans. Rise till light. Bake at 390-400 for 20 mins for buns, longer for bread. 1 c. Tenderflake lard + ½ c. marg. Scald milk. Used quick yeast. Wait till milk is cool enough that it won’t kill yeast! After milk is hot, put in sugar and shortening into milk. Made with Crisco. Knead well and let rise till double in size. Set on pans and let rise till light. Bake in mod. hot oven. A very basic recipe! Use for sweet buns and for cinnamon buns! It always turns out. Enough flour to make a soft dough. Mix sugar and lard, beat well. Beat egg and add to first mixture. Add all to milk, yeast, and salt. Knead down well, not too hard. Let rise a little, knead down again. Let rise a little. Roll in long rolls and braid. Put in loaf tins and let rise 2 ½ to 3 hours. Just before putting in oven, wipe the top over with a beaten egg and a little sugar. Sprinkle with nuts if desired.